A number of "most wanted" ETA suspects have been arrested in separate operations in recent months. Madrid, Spain (CNN) -- The Basque separatist group ETA plotted to kill Spain's prime minister three times in 2001 but a shoulder-fired missile that apparently was to be aimed at his aircraft repeatedly malfunctioned, a Spanish judge concluded Tuesday. After three unsuccessful attempts to fire the missile during then-Prime Minister Jose Maria Aznar's visits to Spain's northern Basque region in April and May 2001, ETA sent the faulty weapon to ETA operatives in France for inspection, the judge wrote. The judge detailed the plot against Aznar in an order remanding to jail an ETA suspect, Pedro Maria Olano Zabala, who was arrested last Thursday in northern Spain. Olano, 49, is charged with conspiracy to murder, membership in a terrorist group and possession of weapons of war and explosives, wrote Judge Fernando Grande-Marlaska after an arraignment Tuesday at the high-security national court in Madrid. Aznar, a conservative who was elected to two terms from 1996 to 2004, survived an ETA attack in 1995, when as opposition leader his armor-plated sedan bore the brunt of a bomb as he drove by. Olano was part of ETA's logistics team that clandestinely moved weapons between hideouts and into the hands of ETA militants who would carry out attacks, the judge wrote. In 2004, police located two SAM-7 portable missiles at ETA hideouts in France, the judge wrote, without specifying if those were used in the failed 2001 plot. ETA is blamed for more than 800 deaths in its long fight for Basque independence and is listed as a terrorist group by Spain, the European Union and the United States. Olano is among six ETA suspects arrested in separate operations in recent days. 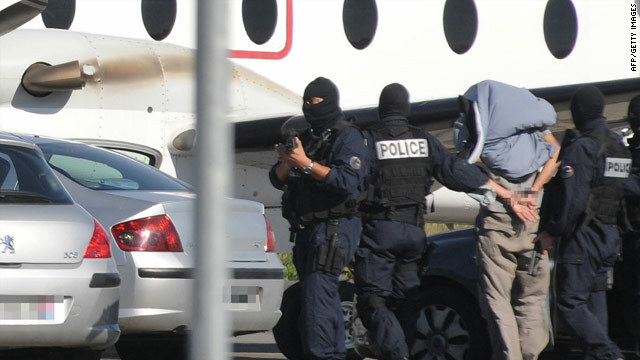 Last Saturday, police arrested four of the "most-wanted" ETA suspects, in France and Portugal, including one who stole a police car to try to escape, Spain's Interior Ministry said in a statement. The first of last Saturday's operations started when Spanish Civil Guards in the village of Bermillo de Sayago, near the Portuguese border, stopped a man driving a van, the statement said. The van contained explosives, weapons and documentation, and while Civil Guards were checking it, the man stole a police car and fled to nearby Portugal. Spanish authorities immediately contacted Portuguese police, who quickly arrested the suspect in the stolen patrol car. Soon after, Portuguese police arrested a woman, driving a sedan, suspected of having been ETA's go-ahead "lookout" for the van with explosives, the statement said. At about the same time, in a forest near the town of Chadrat in central France, police arrested two other ETA suspects, also a man and a woman. They were detained after they removed €2,000 (nearly $2,900) in cash from an ETA hideout which the police recently discovered and have been monitoring. The suspects were armed and the cash was presumably to finance ETA attacks, the statement said. Spain's Interior Minister, Alfredo Perez Rubalcaba, two weeks ago issued an unusual public warning that ETA could be a planning a major attack or a high-profile kidnapping, and the government raised its nationwide terrorism alert to "level two." After the latest arrests, Rubalcaba said Sunday, "We know what ETA is doing. The message to ETA is, when you go to a hideout or are on a highway, the police will be looking for you, until this is over."